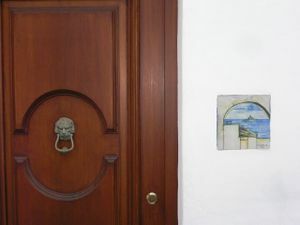 I had been to the Aeolian Islands before, and suspected that this was where I'd like to eventually hide out. These are seven islands within sight of the main island of Sicily that have been inhabited since prehistoric times. 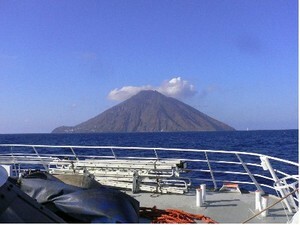 The most famous of the islands is Stromboli, which is an active volcano that has been in eruption for hundreds of years. But it’s no Vesuvius. Stromboli is sort of the Old Faithful of volcanoes. It has been exploding rather spectacularly every twenty minutes or so for a few millennia. It’s a beautiful, slightly scary-looking cone poking about 3000 feet out of the beautiful blue sea. At night you can watch it go red during explosions and see some lava flow. I have long been fascinated with Stromboli, at least since I saw Roberto Rosselini’s 1950 film of the same name, which starred Ingrid Bergman. The image of her running from a rain of rocks made me a little bit leery of the place, but we arrived in a quiet moment. 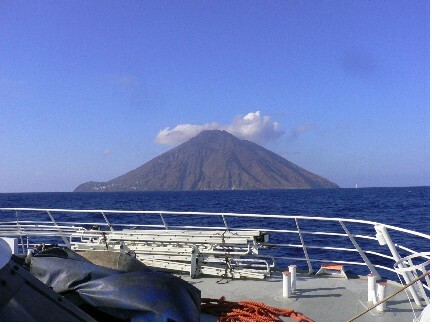 We got our first up-close look quite unexpectedly when the captain of our hydrofoil decided not to stop at our port of call, Panarea, because there was a wait to dock, but to move on to the next stop, Stromboli. A near riot broke out among the Panarea passengers and I thought we weren’t stopping at all. It proved to be just a detour, one which allowed a great view of the island, recent lava flows, and the town with its beautiful black sand beach. 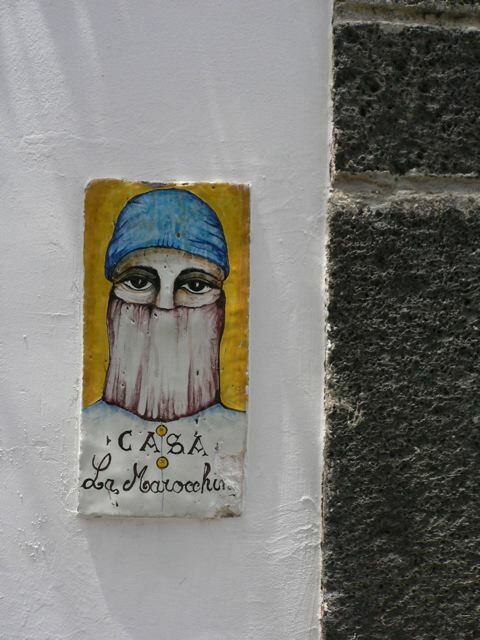 When we arrived in Panarea, I felt like I’d finally made it to the jet set. Not that a jet can come anywhere close, but the island is beautiful, with its bright white, Greek-style villas, its dramatic landscape, and its tropical vegetation. Only about 200 people live there year round, but in season it’s a glamorous community of part-timers, well-off tourists, nice shops, and good restaurants. There are no cars on Panarea, so one gets around by scooter or golf cart. 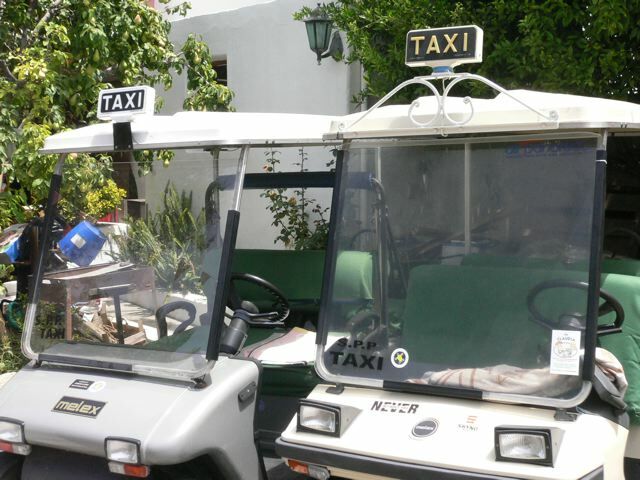 Here’s the Panarea-style taxi. Well, actually we got around by foot, or by boat. It’s a hilly place, so it was good exercise that worked off all the pasta and pizza we consumed. The white houses surrounded by gardens are really delightful, and they are enhanced by ceramics embedded in the white walls or holding decorative vegetation. Here are a few house details. 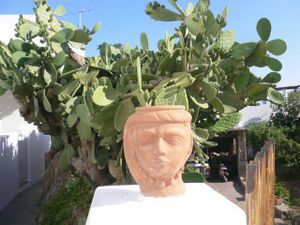 The houses of Panarea are often beautifully landscaped with wonderful gardens, despite the general dryness of the climate. Our house was surrounded by citrus trees, spectacular yuccas, cacti, and bougainvillea and the roof was a terrace, complete with rugs, pillows, and sofas from which we could watch Stromboli act up or the continuous parade of yachts, calling on the island or passing by. 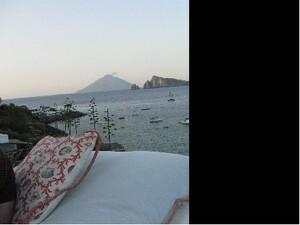 Here’s the view of Stromboli at sunset. When you have an eight-year-old, volcanos become even more exciting, and sitting up here watching the glowing magma popping from the crater and the bats sweeping over the house and the planets moving along the plane of the ecliptic we had lots of speculative discussions about tsunamis (there was a 30-foot-wave caused by Stromboli in 2002), Krakatoa, Vesuvius, and the extinction of the dinosaurs. Coming soon: More from the Aeolian Islands.